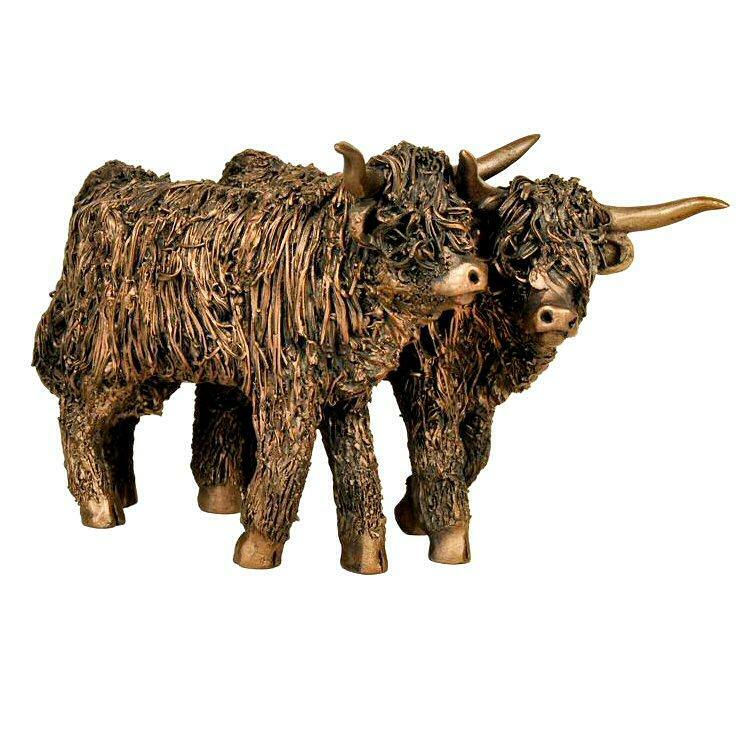 Beautiful sculpture in cold cast, hand finished bronze of a pair of Highland heifers by celebrated animal sculptor Veronica Ballan, from the Frith collection. Highland cattle have an ancient lineage that goes back many centuries. At home in the often bleak and inhospitable uplands of western Scotland, Highlanders have a remarkable ability to take driving rain, snow ice and bitter winds in their stride and somehow thrive on sparse vegetation - characteristics that have made them highly prized among cattle breeders. This expertly crafted sculpture in Veronica Ballan's unique style would make a worthy addition to any collection or a fine gift for any lover of this iconic breed. Supplied securely boxed and packaged.